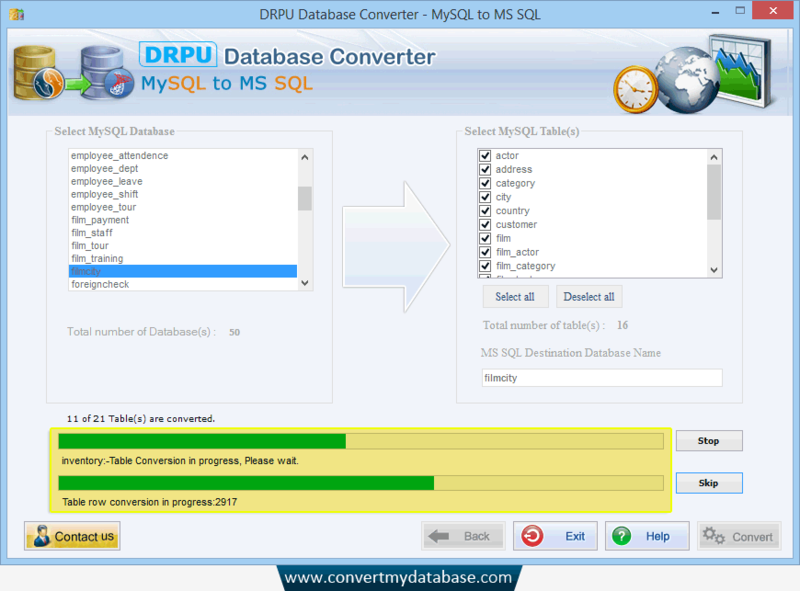 MySQL to MS SQL database Converter is migration utility that converts MySQL database records into MS SQL database records. Database converter program migrates entire or selected database records with support to all major versions of MS SQL and MySQL. Software provides option to convert Views, Indexes with all necessary attributes as well as primary key and foreign key constraints. Database conversion utility provide support to all key constraints, null value constraints, data types, tables (including rows and columns), schemas, attributes etc even after database conversion. Full Unicode architecture support : Database migration software fully supports Unicode architecture character set and provides easy and fast database conversion from MySQL database format to MS SQL database format. Avoid data redundancy : MySQL to MS SQL Database Converter restricts duplicacy of data during conversion of MySQL database records into MSSQL database records. Convert MySQL database records into MS SQL database records. Maintains complete data accuracy and integrity. Provide structural support to the converted MS SQL database. provide facility to convert views, indexes. Connect MySQL and MS SQL server globally or locally. All major versions of MySQL and MS SQL database formats are supported.